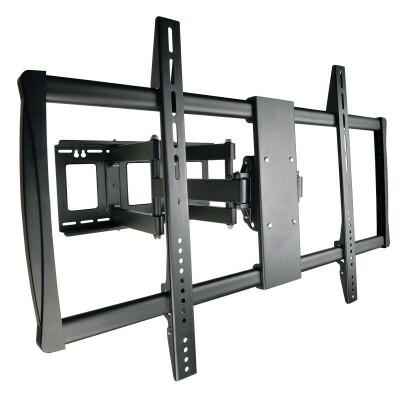 The VESA-compliant DWM60100XX Swivel/Tilt Wall Mount allows you to mount your flat-panel television, monitor or other display on the wall. Ideal for home theaters, classrooms, boardrooms, hotels, bars and restaurants, it fits most flat-panel displays from 60 to 100 inches. The articulating arm has six pivots that adjust independently for angle to give you maximum flexibility in positioning your display to fit your environment and comfort level. A 90Â° swivel, -15Â° to +15Â° tilt and -3Â° to +3Â° screen level adjustment capability minimizes glare and provides comfortable viewing from multiple angles. Durable all-metal frame with scratch-resistant powder-coated finish supports up to 125 kgs (275 lbs.) Frame is open for easy wall access. Mounting hardware included Conforms to VESA-compliant displays with any of the following mounting hole patterns: 200 x 200 mm, 300 x 300 mm, 400 x 200 mm, 400 x 400 mm, 600 x 400 mm, 600 x 900 mm, 800 x 400 mm and 800 x 600 mm. â— Fits most flat-panel televisions, monitors and other displays from 60 to 100 in. 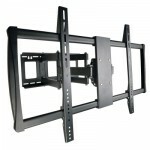 â— Fits most flat-panel displays from 60 to 100 in.